Three fifths of our planet is water, yet as the world’s population continues to grow, people cling more than ever before to the small portion that is dry land, creating overcrowded conditions that lead to disease and degeneration of all kinds. Waterborne communities of the past have been systematically eliminated by their local governments in most parts of the globe, as have nomadic groups of all types. We believe that seagoing raft communities represent a huge, underutilized potential for healthy life on the planet – in contact and in harmony with the elements of nature; world-nomadic, in contact and in harmony with all cultures; reviving and bringing forward all the positive aspects of seagoing life of all times, with the character-building elements inherent in the necessary struggles of everyday life on the oceans of the world. We do not reject the advances of modern technology: witness the website and email contact, for example. We welcome these advances as harbingers of a future in which all people everywhere will truly have equal access to information and opportunities. At the same time, we also strive to recognize and preserve what is inherently valuable and worth bringing forward from all seagoing traditions of all time. 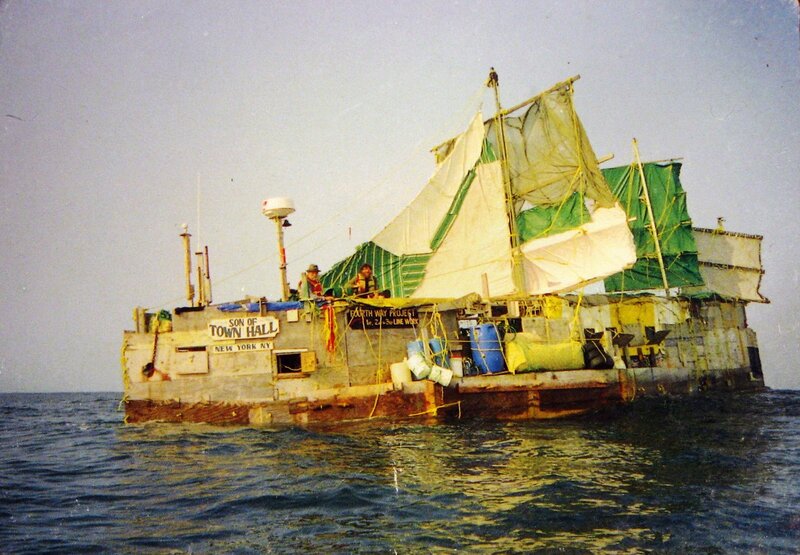 We are innovators in building vessels from recycled scrap, with unconventional designs, which go to sea safely despite the doubts and taunts of many who have forgotten the pioneering and radical minds and spirits who explored and spread the human population throughout the planet, and continue to reach out toward new ideas daily. We believe in the essential three part nature of the human being: physical, psychological, and spiritual; and the necessity to nurture and develop all three. We draw upon the best and the deeply true from all cultures of all time and seek creative new solutions to age old problems through experimentation, group interaction, and direct perception and inspiration. A raft is a vessel that floats because of the very nature of the materials with which it has been constructed – such as logs, styrofoam, empty plastic bottles, etc. ; unlike a boat, which is dependent upon the watertight integrity of its hull in order to stay afloat. The Neutrinos have built more than twelve rafts. Each of the rafts has been built almost entirely from salvaged and recycled materials. Each has been designed for the environment and waters upon which it was to be used.